Did you ever have a day when you thought “I didn’t get anything done today!”? Taking two minutes to do the following activity will change your mind every time! A terrific way to end your day is to take two or three minutes right before going to sleep to list in a notebook all the things you’ve accomplished that day, including good choices (ate two servings of fruit), exercise done (walked 10,000 steps), good deeds and small acts of kindness (wrote a letter to grandma). It’s a quick and easy way to feel good about what you really did and generate a feeling of satisfaction before falling asleep. 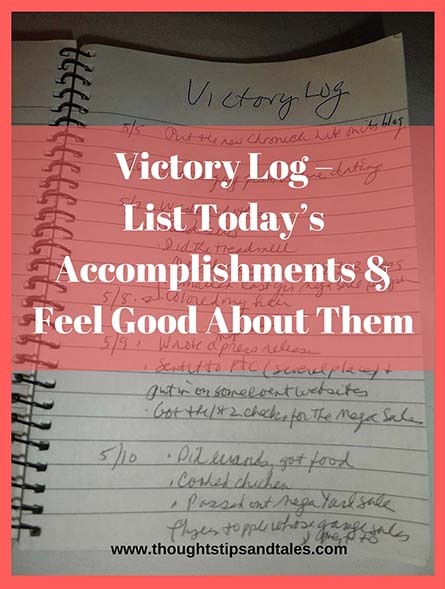 This entry was posted in accomplishments, efficiency, gratitude, journaling, life, miscellaneous, stress relievers, Uncategorized, victory log and tagged accomplishments, diary, feeling good, journal, journaling, list, miscellaneous, satisfaction, stress reliever, thoughts tips and tales, to do, victory log. Bookmark the permalink.